LAST-A-FOAM® WSF Series high-density polyurethane flexible foams are flame-retardant, durable and self-skinning (also known as integral-skin foams). They are used extensively in aircraft flight decks and cabin applications. Open-cell WSF-1121 products are used by airframe manufacturers for molded and fabricated flight-deck padding and aircraft interior parts. 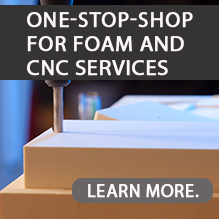 These self-extinguishing, flexible urethane foams can be custom-molded to your exacting specifications. PLEASE NOTE: Our two WSF foam series are not offered for sale as liquid kits or sheet stock. They are only available within a finished parts program. This foam is ideal as a flexible seal where aesthetics are important. It can also be tinted and painted a variety of colors. This is a tough integral-skin polyurethane foam system that can be pigmented and in-mold painted for a lasting finish.